You guys. This week. This week. Is it going to end? Please? Someone tell me it’s almost over. I’m not sure I’m going to survive any more of it. It’s like I desperately need an “off” button or something. But when you’re a mom, you don’t really get one of those do you? Ha! You should. Or at least a mute button or something. Sometimes I swear that would be enough– just to be able to turn off the noise. I think I could handle the rest of it, if I could just mute everything and plod along in blissful silence. So yeah. I’m thinking a mute button would suffice. And if I could order it on Amazon Prime, well, that would just be swell. Thank heavens I live in a reality that includes dessert for breakfast. Because if I don’t get a mute button, I think I should most certainly be allowed to have dessert for breakfast. amiright?! 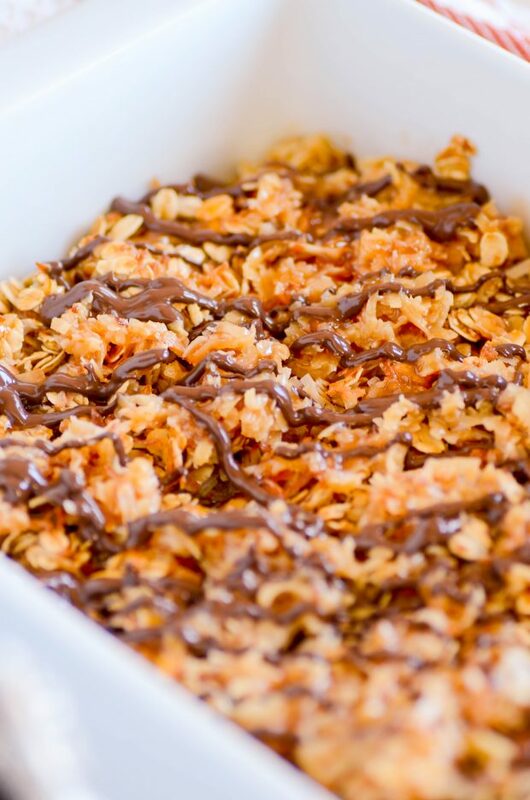 This Samoas Baked Oatmeal is a revamp of a very old, archived recipe that I am super excited to share with you today!! The original recipe was for a single-serve, microwave version, and you can still find it here. But I like this baked version much better! 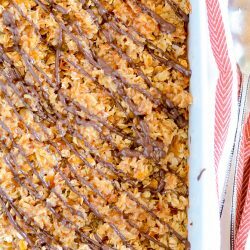 Today’s rendition is simply my favorite go-to baked oatmeal transformed into an indulgent version of Samoas Girl Scout Cookies. 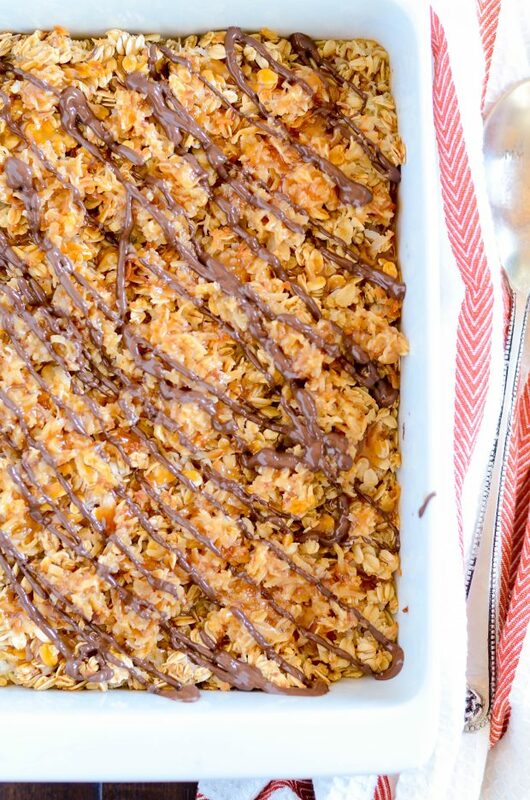 The plain oatmeal recipe already called for coconut, so it’s a pretty natural transition to add caramel and toasted coconut to the top! And of course a chocolate drizzle. Because #chocolategoals. You can make the oatmeal base the night before and bake it in the morning if you want to save a little time. And be sure to toast the coconut ahead of time too. Then all you’ll have to do is mix in the caramel, and voila! 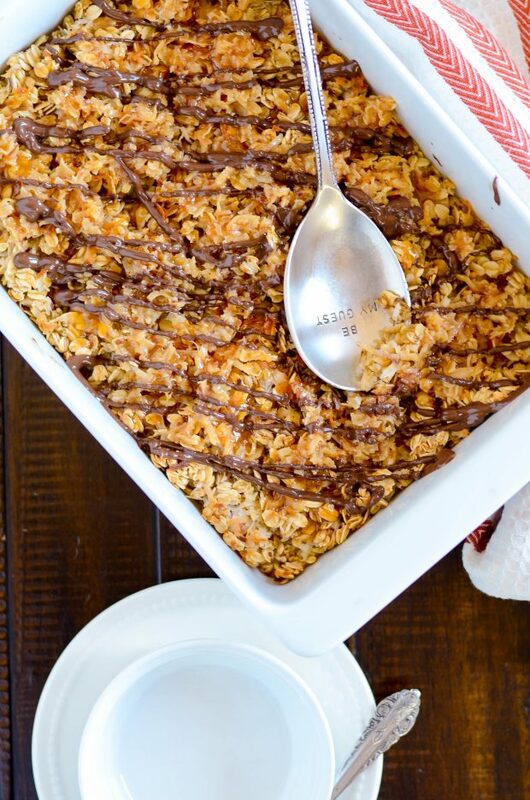 My favorite baked oatmeal recipe topped with caramel coconut and melted chocolate. 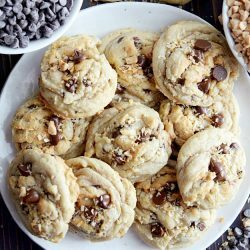 It's like eating cookies for breakfast! Preheat the oven to 350º (if you aren't preparing the night before). Grease an 8x8 baking dish. Whisk together the milk, egg, sugar, salt, baking powder, butter, vanilla, and oil. Mix in the oats, and 1/2 cup coconut.. Pour mixture into the prepared baking dish. Bake for 30 minutes. Meanwhile, toast the remaining 1 cup of coconut on the stovetop. Remove from heat and mix in the caramel sauce. 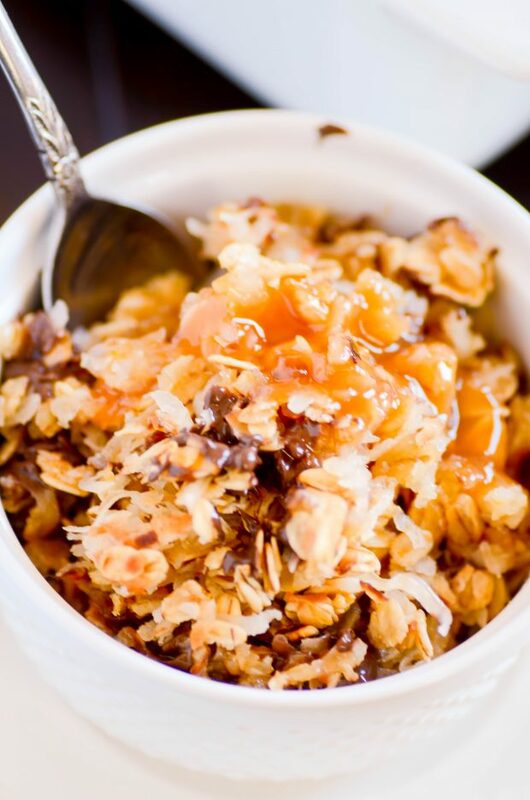 After the oatmeal has finished baking, spread the caramel coconut over top. Drizzle the chocolate over the the caramel topping and serve! 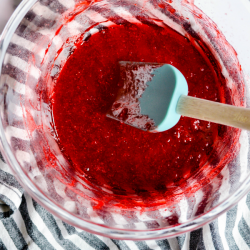 *If preparing the night before, cover and refrigerate over night (reserve the topping ingredients for after baking). Bake for 35 minutes in the morning. I’m still awaiting the day that these Girl Scout cookies make their way over to this side of the pond… It took Oreo forever, we’ve only had them here for approx. 1 year and Oreos are 100 over there. One day before I’m old, hopefully. Until that day, I guess I’ll be following your series and baking the inspired by recipes. This looks AMAZING! 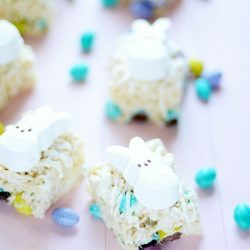 How many servings does the recipe make?